CANNON BALL, N.D. -- The company building the $3.8 billion Dakota Access oil pipeline has asked a federal judge’s permission to circumvent the Obama administration and move ahead with a disputed section of the project in North Dakota. This, as opponents held protests across the country against the pipeline. Dallas-based Energy Transfer Partners and a subsidiary asked the court Tuesday to let them lay pipe under a Missouri River reservoir, a plan the Standing Rock Sioux tribe says threatens its drinking water and cultural sites. The Army Corps of Engineers said Monday it needs more time to study the impact of the plan. In a statement Tuesday, the company blamed the Obama administration for “political interference” in the pipeline review process. More than two dozen people were arrested near Mandan, North Dakota, after a group of about 400 protesters put a truck and tree branches on BNSF Railway tracks near a pipeline work staging area and tried to set it on fire, Morton County sheriff’s spokesman Rob Keller said. “What they are doing here is a crime, an environmental crime, and there are real victims,” he said. “It may seem hopeless, like David against Goliath, but we believe that if we’re persistent and we recruit, that this movement will grow and hopefully these kinds of projects will stop,” said protester Lee Shen of Thetford Center, Vermont. The Corps on Monday called for more study and input from the Standing Rock Sioux before it decides whether to allow the pipeline to cross under Lake Oahe. The 1,200-mile pipeline that’s to carry North Dakota oil through South Dakota and Iowa to a shipping point in Illinois is largely complete except for that stretch, which will skirt the tribe’s reservation. Gov. 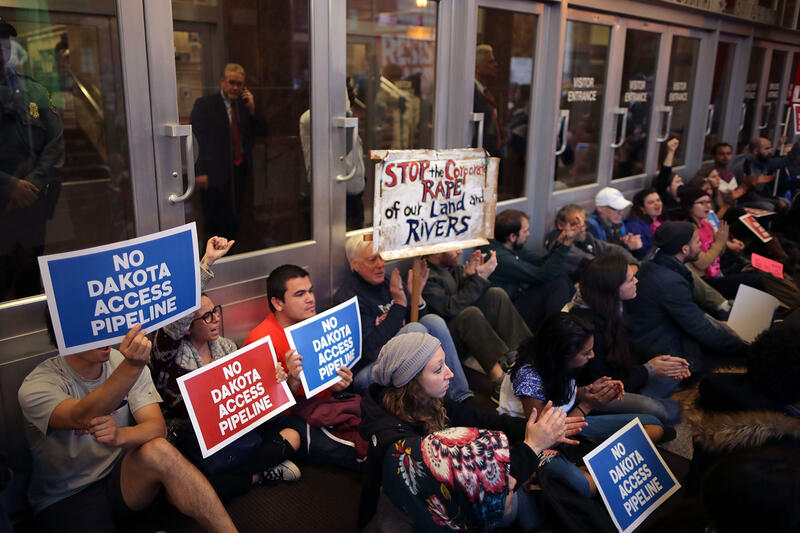 Jack Dalrymple said Tuesday that an additional delay “does nothing but prolong and intensify the public safety issues imposed on Morton County and the state of North Dakota since the beginning of August,” when protests against the pipeline broke out. In his statement, Dalrymple said a decision on the project easement “is long overdue” and that the pipeline would be safe. The Corps in July granted Energy Transfer Partners the permits needed for the project, but it said in September that further analysis was warranted, given the tribe’s concerns. Its announcement Monday came amid speculation that federal officials were on the brink of approving the crossing. ETP last week began preparing equipment to bore under the river. ETP disputes that the pipeline would endanger the tribe, and CEO Kelcy Warren noted earlier that Army Assistant Secretary Jo-Ellen Darcy had informed company officials and Tribal Chairman Dave Archambault that the Corps’ previous permit decisions “comported with legal requirements.” ETP contends that the Corps has no legal justification for the delay.